If you are here from Vicki at 2 Bags Full Grow Your Blog party. Thank you for stopping by. My post for the party is here. The guild I belong to had a jelly roll race after January's meeting. I don't own any jelly rolls, shocking I know. I just never had the desire to want one. I wanted to participate. So I decided to go my own way, I cut up some batiks into strips and pieced them together. I am going to use them as the background for a landscape, wall hanging quilt... we'll see how it goes. This is what I have so far. The white pieces are freezer paper. I drew out some branches on freezer paper and roughly cut them out for placement first. I'll use them to cut out the fabric pieces, by pressing the freezer paper to the fabric and then cutting it out. I already have a couple smaller branches cut out of fabric. They don't show up very well yet. I plan on doing some thread painting on them so hopefully that will bring them to life. This is a close up of the fairy I drew. I am going to add some daisies. I still have a long way to go with this. Hopefully it turns out like the vision I have in mind. Time will tell. Looks really nice to me, good idea. This is lovely. What a beautiful wall hanging. A great start and lovely colours in your background. Love your applique work, Cindy. Such a clever way to dress up that pretty background! 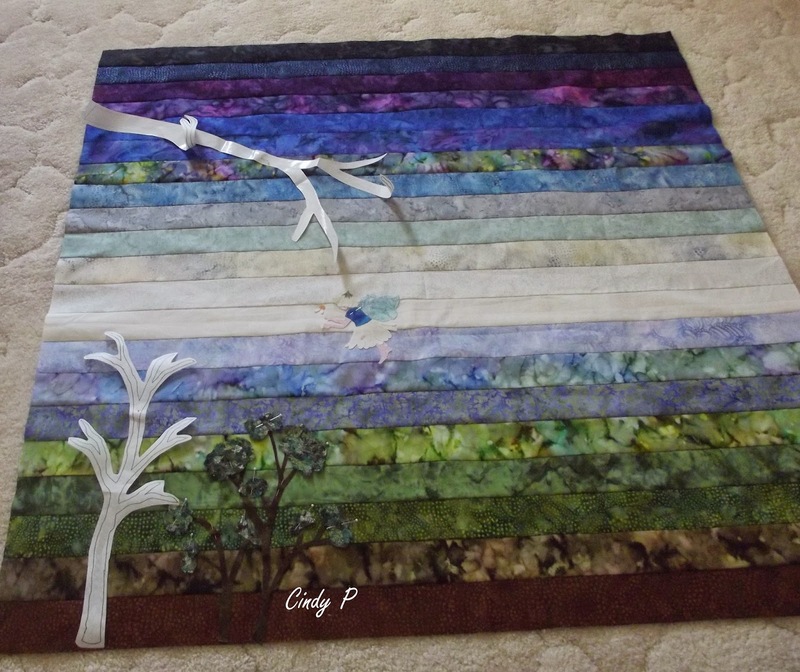 Cindy, your quilt background is wonderful! I love that little fairy you made! This is going to be a very pretty quilt.